The pronunciation "MEE mas" is also acceptable. 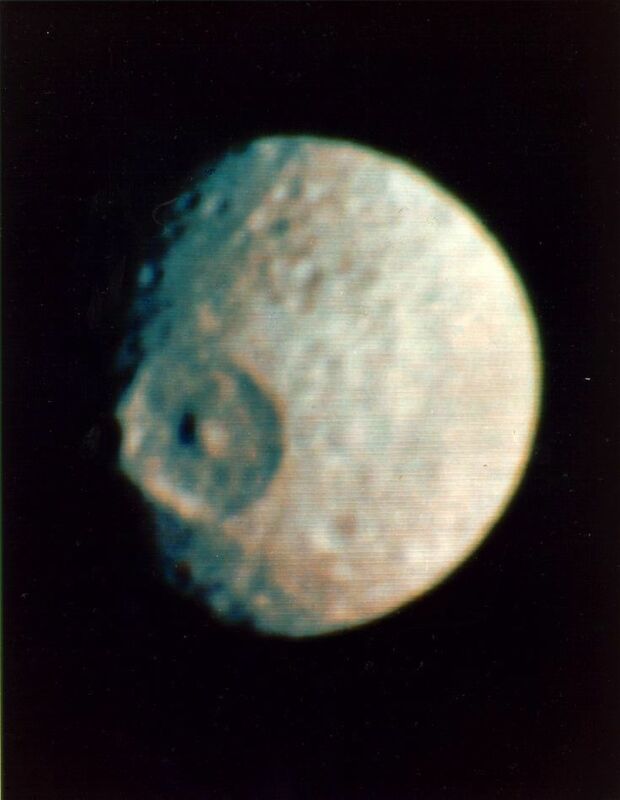 Mimas was one of the Titans slain by Hercules. Discovered in 1789 by Herschel. Mimas' low density (1.17) indicates that it is composed mostly of water ice with only a small amount of rock. The surface of Mimas is dominated by an impact crater 130 km across, known as Herschel; it's almost 1/3 of the diameter of the entire moon. Herschel's walls are approximately 5 km high, parts of its floor measure 10 km deep, and its central peak rises 6 km above the crater floor. The impact that made this crater must have nearly disrupted Mimas. Fractures can be seen on the opposite side of Mimas that may be due to the same impact. The surface is saturated with impact craters. But no others are nearly as large as Herschel. This suggests that early in its history, Mimas was probably impacted by even larger bodies than the one that created Herschel which completely disrupted the new moon (wiping out the evidence of earlier large impacts) but that the impact debris then coalesced again to form present-day Mimas. How big a hit can a planet or moon take before being completely disrupted?